Top quality and service are and have always been the priority of J.C. Bean Sprouts Inc. Besides careful selection of our raw material and maintaining highest production standards, we have been searching for ways to improve the quality and the handling of our fresh products. Until now we have offered pre-packaged Bean Sprouts in shrink-wrapped plastic trays or loose in 10 lb packs. New technologies and materials became available and after a series of performance tests, we have decided to upgrade our production line. An appealing presentation has been one of the priorities. We have selected colors and other elements that complement and emphasize the freshness and values of the product. 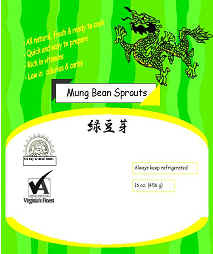 We have installed a purpose designed, fully automatic weighing and packaging machine for bean sprouts. The use of this machine assures careful handling of our delicate product. In addition, our production line now has better capacity. This gives us much more flexibility. The new packaging style has been chosen with easier handling in the stores, appealing and clean presentation and improving shelflife in mind. Please speak to us if you prefer other sizes or styles. After the recent expansion we are fully equipped and flexible to create the style that best suits your needs.